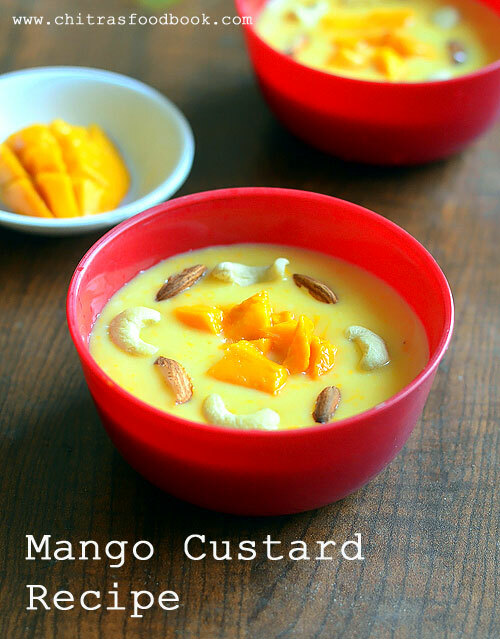 Mango custard is an yummy variation of fruit custard recipe. Fruit custard is my family’s favorite dessert recipe. I make it at least once in a month during weekends If I make Biryani or any variety rice for lunch. Raksha love it like anything. Recently I came across this mango custard recipe. Tried for the first time and it came out very well. It was a big hit in my home. If you are looking for some interesting, fail proof dessert recipes with mango, do try this mango custard recipe. You will love it for sure. For variations, you can replace sugar with condensed milk. You can use store bought mango pulp too. But make sure to add the mango pulp after the custard mixture cools down else it may curdle. Also serve immediately after adding mango pulp else it will become watery. Ok, Lets see how to make mango custard recipe with step by step pictures. Boil milk in a pan. Add sugar, mix well. Take some milk from the pan into a small bowl and add custard powder. Mix without lumps. Add to the hot milk and mix well. Switch off the flame and let it cool down in a refrigerator. Wash and peel the skin of ripe mango. Chop to cubes and reserve 2 tbsp from it. Grind the remaining to smooth pulp. Add the mango pulp to custard mixture. Mix gently. 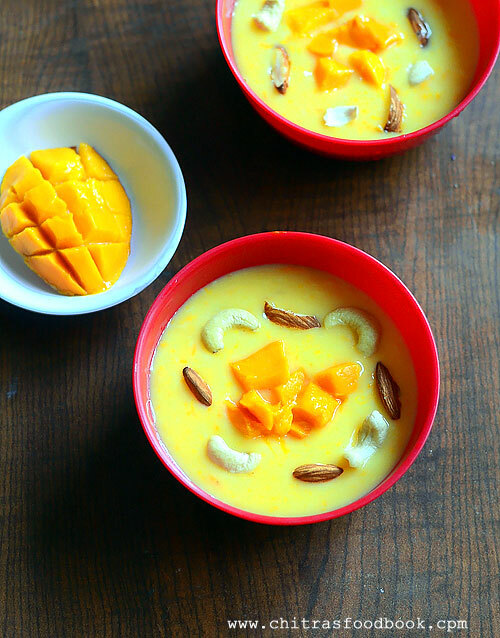 Garnish with chopped mango and nuts. Serve immediately or refrigerate and serve chilled. Enjoy ! Wash and peel the skin of one ripe mango. Chop them into small cubes. Reserve 2 tbsp of chopped mango for garnishing the custard. Grind the remaining to a smooth puree without adding water. Measure 1/4 cup from it and set aside. Alternatively you can use store bought mango pulp too. Take a wide pan or bowl and add the milk. Boil it. Add sugar and mix well. Boil in low flame. Take 1/4 cup of boiled milk and add the custard powder. Mix without lumps. Add this to the milk + sugar mixture. Mix well and boil in low flame till it starts to become thick. Check for taste, add more sugar if needed and boil for a minute. Switch off the flame. Custard is ready. Refrigerate the custard till it cool down completely. It becomes even more thick after refrigeration. Just before serving, take the custard and add the mango pulp. Mix well and transfer to a serving bowl. Garnish with reserved mango cubes and chopped nuts. Adjust the quantity of sugar based on your taste. Check for taste and add more if needed. After adding custard powder mixed with milk, boil till it becomes slightly thick else it smells raw. Do not rest the custard for long time after adding the mango pulp. It will become watery. Remember to add mango pulp only after custard mixture cool down completely. It may curdle if you add when hot. You can adjust the consistency of custard as you wish. You can add more mango pulp if you like. 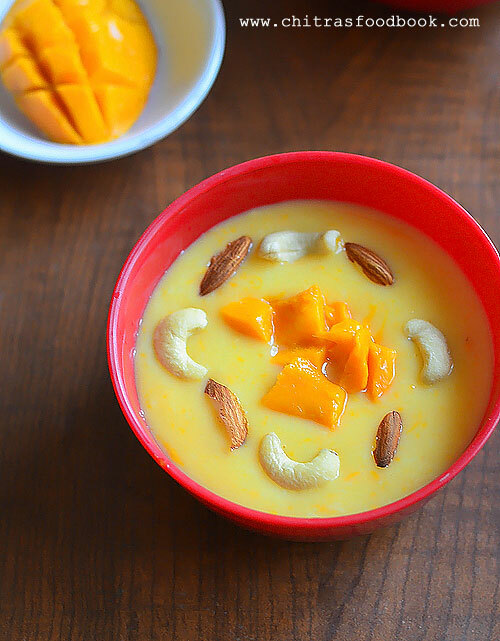 Easy, yummy mango custard is ready to enjoy !